Asus is going the way of the iPhone, at least during the first phase of Zenfone 4 models. Size wise that is. The largest iPhone is the Plus model at 5.5-inches and similarly, the Zenfone 4 launch will see a 5.5-inch maximum size according to what we’ve seen and read. 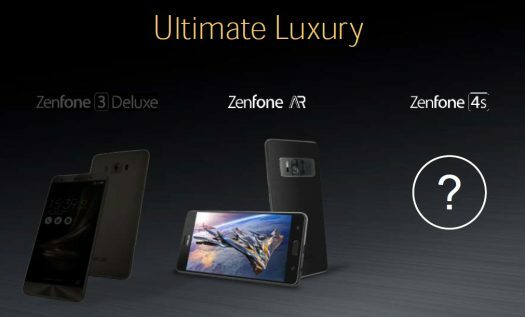 We do know from the Asus CEO at an investors conference that there will be a Zenfone 4s which will be the next top premium model. As Asus sees it, there is the Zenfone 3 Deluxe, then the Zenfone AR, and then the Zenfone 4s. What we can say with virtual certainty is that there will be 5.2-inch and 5.5-inch models for the Zenfone 4 when it is announced August 17th. A 5.5-inch equals Apple’s biggest offering and the 5.7-inch sized Zenfone models may be a thing of the past. Or at least they will be coming later. The 6.9-inch Zenfone 3 Ultra does not appear to have a model in this next generation. It’s possible however that the Zenfone 4s will come in a wide range of sizes including something that big. Personally? I hope there is still a big model coming because I want the real estate for the display. Maybe it didn’t sell. Or perhaps not bringing the Zenfone 3 Ultra to the US and North America was a mistake. A 6.9-inch smartphone in North America would fill a niche or void and because of that, it may have actually sold better than other models simply because it wasn’t competing with Samsung and Apple on that size. Reasoning? Perhaps the extra AMOLED screen by going 5.7-inches on a Pro version comes down to cost. The costs for AMOLED displays has gone up because of the huge demand right now. Less supply means higher price. Or perhaps Asus found feedback from customers was more positive from the slightly smaller size. Or perhaps Asus sees the #1 smartphone manufacturer following a set of sizes and if they are successful with that, then perhaps it’s worth following as well. So if we’re right, and 5.5-inches is the biggest offering at launch, will you be disappointed?